Pirelli & C. S.p.A. is a multinational company based in Milan, Italy, listed on the Milan Stock Exchange since 1922, with a temporary privatization period by the consortium led by the Chinese state-owned enterprise ChemChina. The company is the 5th largest tyre manufacturer behind Bridgestone, Michelin, Continental and Goodyear, and is focused on the consumer business (tyres for cars, motorcycles and bicycles). It is present in Europe, Apac, Latam, Meai, Nafta and C.I.S., operating commercially in over 160 countries. It has 19 manufacturing sites in 13 countries and a network of around 14,600 distributors and retailers. Pirelli has been sponsoring sport competitions since 1907 and is the exclusive tyre supplier for the FIA Formula One World Championship for 2011–2023 and for the FIM World Superbike Championship. 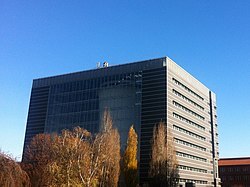 Pirelli's headquarters are located in Milan's Bicocca district. Pirelli is now a pure tyre manufacturing company. In the past it has been involved in fashion and operated in renewable energy and sustainable mobility. On October 4, 2017, Pirelli returned to the Milan Stock Exchange after focusing its business on pure consumer products (tyre for car, motorcycles, bicycles) and related services, and separating the business of industrial tyre. Pirelli has published its Pirelli Calendar since 1964, which has featured the contribution of famous photographers over the years like Helmut Newton, Steve McCurry, Peter Lindbergh, Richard Avedon, Bruce Weber, Herb Rits and Annie Leibovitz. Founded in Milan in 1872 by Giovanni Battista Pirelli, the company initially specialised in rubber and derivative processes and also made scuba diving rebreathers. Thereafter, Pirelli's activities were primarily focused on the production of tyres and cables (for energy and telecommunications). In 2005, Pirelli sold its cable division to Goldman Sachs, which changed the new group's name to Prysmian. 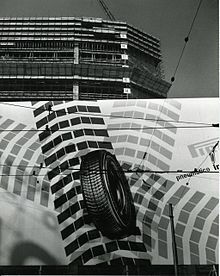 In the 1950s, Alberto Pirelli commissioned the building of a skyscraper, Pirelli Tower, in the same Milanese area that housed the very first Pirelli factory during the 19th century. In 1974, Pirelli invented the "wide radial tyre", upon a request from the Lancia rally racing team for a tyre strong enough to withstand the power of the new Lancia Stratos. At that time, racing tyres were either slick tyres made with the cross ply technique (very wide tyres with a reduced sidewall height), or radial tyres, which were too narrow to withstand the Stratos' power and did not provide enough grip. Both were unusable for the Lancia Stratos, as the radials were destroyed within 10 km, and the slicks too stiff. Lancia asked Pirelli for a solution, and in 1975 Pirelli created a wide tyre with a reduced sidewall height like a slick, but with a radial structure. Subsequently, Porsche started using the same tyres with the Porsche 911 Turbo. In 1988, Pirelli acquired the Armstrong Rubber Company, which was headquartered in New Haven, Connecticut, for $190 million. In 2000, Pirelli sold its terrestrial fibre optic cables business to Cisco and its optical components operations to Corning, for 5 billion euro. It invested - through Olimpia -part of the resulting liquidity to become a majority shareholder in Telecom Italia in 2001, maintaining this position until 2007. In 2002 the company started a range of Pirelli branded clothing, watches and eyewear. In 2005, Pirelli sold its Cables, Energy Systems and Telecommunications assets to Goldman Sachs and the newly formed company was named Prysmian. In the same year, 2005, Pirelli opened its first tyre production plant in Shandong province, China. This was the beginning of the group's production complex in the country. In 2006, Pirelli chose Slatina for its first tyre production plant in Romania, extending the facility in 2011. In 2010, Pirelli completed its conversion to a pure tyre company by selling Pirelli Broadband Solutions and spinning off the real estate assets of Pirelli Re. Fondazione Pirelli was established in the same year to safeguard and celebrate the company's past and to promote business culture as an integral part of Italy's national cultural assets. In March 2015, it was announced that Pirelli shareholders had accepted a €7.1 billion bid from ChemChina, together with Camfin and LTI, for the company. The transaction was completed and the company was delisted in November 2015. In May 2017, it was announced that Pirelli returns to the world of cycling with a new road cycling tyre range, Pzero Velo. In September 2017, the company announced the will to sell up to 40 percent of its equity capital in an initial public offering as it plans to return to the Milan stock exchange in October. Pirelli is focused on the consumer business, producing tyres for cars, motorcycles and bicycles. PZero: tyres for ultra-high performance cars. Cinturato: tyres for high end cars. Winter: tyres for low temperatures and snow. Diablo: road and track tyres. Scorpion: road and off-road tyres. *The performance takes into account, as well as the deconsolidation of Venezuela, a non-recurring fiscal impact of 107.6 million euro linked to the devaluation of active deferred taxation by the Parent Group as a consequence of Pirelli’s new financial status after its merger with Marco Polo Industrial Holding. The Pirelli Calendar is published annually, and regularly features famous actresses and fashion models. The calendar also features the work of many of the most respected fashion photographers in the world, including Herb Ritz, Richard Avedon, Mert & Marcus, Peter Lindbergh, Annie Leibovitz, and Patrick Demarchelier. The Pirelli Internetional Award is given annually for the best international multimedia involving the communication of science and technology conducted entirely on the Internet. "Power is nothing without control" was the well known slogan of Pirelli Tyre Company, and was featured in numerous television and print advertisements. Pirelli is the long-serving main sponsor of Italian football club Inter Milan, having sponsored the Italian team since the 1995–96 season. Pirelli has a history of sponsoring football teams. Pirelli is well known for its long term primary sponsorship of the Italian football club Inter Milan since 1995. Pirelli previously appeared as a sponsor on the shirts of the Maltese football club Valletta for a short time. In reference to Brazil striker Ronaldo’s usual goal celebration of both arms outstretched, Pirelli ran a 1998 commercial in which he replaced the figure of Christ from the Christ the Redeemer statue that towers over his home city of Rio de Janeiro while in an Inter Milan strip. It was controversial with the Catholic Church. Pirelli's sponsorship of football teams is not limited to Europe, South America is a key market and as a result successful clubs have also been sponsored by the tyre company. The Brazilian team Palmeiras, Uruguayan team Peñarol and Argentinian side Vélez Sársfield all had Pirelli as a shirt sponsor. When English football club Burton Albion Football Club built their new stadium in 2005, Pirelli became the title sponsor of the new ground. This was because the new stadium, named Pirelli Stadium lies next to the Pirelli factory in Burton-upon-Trent, Staffordshire, England. In 2009 Pirelli became the title sponsor of the Chinese Super League (CSL), China's top tier football league. In 2012, the company become a major sponsor of the Russian Cup. Pirelli is currently the event title sponsor of the Spanish and Hungarian Grands Prix and sponsored the 2018 French Grand Prix. Pirelli supports rally with their FIA Pirelli Star Driver program as an initiative to support young rally drivers. Pirelli is sponsor of Emirates Team New Zealand in the 35th America's Cup (2017). Pirelli sponsors Alpine World Ski Championship and Ice Hockey World Championship IIHF from 2017 to 2021. The company is also sponsor of the Italian Ski Team and of the Swiss Ski Team. Pirelli is the only allowed tyre brand in the FIM World Superbike Championship since 2007 (along with its support classes, such as the Supersport World Championship). Pirelli has also been awarded the contract for the control tyre supply in the British Superbike Championship from 2008 until at least 2010. Pirelli were also the official tyre supplier of the World Rally Championship from 2008 to 2010, until the company withdrew to focus on its Formula 1 commitments. Pirelli returned to the championship in 2014, however they only supply tyres for a few private teams as Michelin is the major tyre supplier. Pirelli was also supplied Grand-Am Rolex Sports Car Series from 2008 until at least 2010 before replaced by Continental AG in 2011. Pirelli is sponsor of rally and gymkhana driver Ken Block's Hoonigan Racing Division since 2010. Pirelli is the sole tyre supplier in Formula One, following Bridgestone's decision to withdraw from the role at the end of 2010. Pirelli previously competed in Formula One from 1950–1958, 1981–1986 and 1989–1991. Pirelli has also supplied tyres for all FIA Formula 2 Championship and GP3 Series cars since 2011 and 2010 respectively. These are the 7 F1 tyre compounds supplied by Pirelli for the 2019 season. Pirelli were asked to design tyres that degraded rapidly in order to promote more pit stops and closer racing. At the end of the 2011 season, many F1 drivers praised Pirelli's comeback. Controversy surrounded Pirelli's Formula 1 tyres as at the 2013 British Grand Prix seven Pirelli tyres failed: Pérez twice, Alonso, Hamilton, Gutierrez, Vergne, and Massa. Following a safety car period drivers were instructed to stay off the kerbs that were later found to be "razor sharp" and may have been the cause, but the president of the British Racing Drivers' Club rejected the idea that the kerbs could be at fault, saying that "These kerbs have been in since 2009 and we have had thousands and thousands of cars go over these kerbs and they have been absolutely fine". The incidents were described as "unacceptable" by F1 drivers. It was later suggested that the cause of the tyre failures could be the teams putting them on the wrong side of the car. Pirelli stressed that the tyres are of an asymmetrical construction and are not interchangeable, and that if they are used correctly, they do not pose a threat to safety. Pirelli changed the construction of the tyres to prevent further incidents, switching to kevlar belts. During the second practice of the 2013 Belgian Grand Prix, two tyres failed: Vettel and Alonso. One senior figure at Pirelli described the failures as a "big concern", whilst Pirelli's motorsport director Paul Hembery admitted the tyre failures were "a worry for the sport". Following these issues, just one day later Michelin announced that they could replace Pirelli as the tyre supplier for 2014. In October 2013 Fernando Alonso complained that "the quality of the tyres is very on the limit", and that they "will not do 5km". Pirelli motorsport director Paul Hembery said: "Of course Alonso is one of the great F1 drivers, so to hear such comments is disappointing and below the standards you would expect from such a champion. In the Korean Grand Prix Pérez locked a front tyre heavily and then suffered a dramatic failure on the subsequent long straight. Pirelli hit controversy at the Indian Grand Prix where they requested the teams run the tyres a limited number of laps due to their fragility. One senior engineer at a top team said this was the worst blistering ever experienced. In pre-season testing for the 2014 season the tyre on Rosberg's car failed, sending Rosberg into a 200 mph (322 km/h) spin. The incident prompted considerable alarm, and Pirelli stated that the tyre "will not be proposed again". In January 2014 Pirelli signed a contract with the FIA to supply tyres to Formula One for the 2014, 2015 and 2016 seasons. Later in 2014 Lewis Hamilton described the Pirelli wet weather tyres as "They're not great tyres. That's no secret". "These are comments by drivers that have not been made in an official way to us. Of course, if Pirelli was requested by the teams and the FIA to reconsider the technical capability of the wet tyre, Pirelli would do it immediately" was the comment of Pirelli's motorsport director Paul Hembery. At the 2015 Belgian Grand Prix, during practice, Rosberg suffered a dangerous tyre delamination at 200 mph (322 km/h). Rosberg said the incident was "quite a shock". During the subsequent drivers' briefing, double world champion Lewis Hamilton raised concerns about tyre safety following the high-speed blow-out suffered by teammate Nico Rosberg. Concerns were also brought up by four-time world champion Vettel, and double world champion Alonso. Pirelli relied on race director, Charlie Whiting, to defend Pirelli's record in the meeting. During the race a tyre on Vettel's car suffered from a blowout at 200 mph (322 km/h). The four time world champion described the failure an "unacceptable", and added that Pirelli's tendency to blame failures either on debris on track or a driver going over a kerb for tyre failures was incorrect, confirming that "I didn't go off the track and out of the blue the tyre explodes". Following the race Rosberg was critical of the poor quality of Pirelli tyres, saying "Vettel exploding his tyre is really poor. It shouldn't happen and that it keeps on happening, in other categories as well and today with us, and with me on Friday both of us were just so lucky". The Grand Prix Drivers' Association chairman said: "We need to stop the sudden explosions." Immediately after the race Pirelli claimed that excessive wear caused the blowout, blaming Ferrari for running the tyre too long. However, following a more detailed analysis Pirelli said that in fact wear was not to blame, but instead a cut had caused the tyre failure. To counteract further problems at the next Grand Prix, Monza, Pirelli wanted to insist that teams run the tyres at high pressure, beyond their design parameters. However, double world champion Lewis Hamilton described these rules as a "disaster" and double world champion Fernando Alonso described them as "strange" so Pirelli was forced to backtrack on their proposal. After these comments, Pirelli attempted to censor the drivers by asking them to not criticise the tyres in public in the future. The situation did not improve at the next Grand Prix at Monza. Here, Pirelli reported a higher than expected number of cuts forming in the tyres. During the race, one of Hamilton's tyres dropped below the regulation pressure dictated by Pirelli, despite the tyre having been prepared by a Pirelli technician. Neither Mercedes nor Hamilton were punished for the infringement. Later in 2016, the necessity to run Pirelli tyres at high pressure was described as a "joke" by triple world champion Lewis Hamilton, world champion Jenson Button, and world championship runner-up Felipe Massa. Above any criticisms, in 2016 the renewal of the contract as sole supplier was strongly supported by the protagonists of the Formula 1 circus. A number of changes to the Formula 1 tyres were introduced for the 2017 season. The most obvious visual difference was an increase of width by 25%, both front and rear, increasing from 245 to 305mm at the front and 325 to 405mm at the rear. The actual rim size remained unchanged from the traditional 13 inches. This is part of a package of measures expected to cut lap times by around five seconds relative to 2015: although the improvement might be even bigger. Most of that extra speed has been found through corners, as the cars have got wider and will generate at least 20% more downforce compared to last year thanks to bigger wings and increased aerodynamics. These faster cornering speeds—to the extent that some corners have now effectively become straights, already leading to circuit modifications—have imposed significantly increased loads on the tyres, meaning that there is a completely new philosophy behind Pirelli’s 2017 range. Having followed the brief to provide deliberate degradation for the past six seasons, there is now a new directive to make tyres with less degradation that are more resistant to overheating for the latest generation of much faster cars. As a result, the tyre structure and compounds are brand new. In April 2012, Pirelli & C. SpA signed joint venture agreement with Indonesian counterpart PT Astra Autoparts a subsidiary of PT Astra International for the construction of a motorcycle tyre plant with a total investment of $120 million. 60 percent shares will be held by Pirelli. Pirelli hoped to strengthen its presence in the largest motorcycle market in the world, the Southeast Asia region which has 250 million motorcycles. In July 2018, Pirelli launched a F1 wheel shaped Bluetooth speaker, P Zero Sound. The Bluetooth speaker measures 12.9-inches in diameter, weighs 21 pounds and has a 100-watt amplifier, a 100mm midwoofer, a 25mm tweeter and also offers Bluetooth 4.0 with AptX for wireless connectivity. IXOOST is the manufacturer of P Zero Sound speaker, which majorly manufactures Motorsports-themed audio systems. The wheel shaped speaker costs €2400, which is equivalent to about $2,800. ^ a b c "Highlights". Pirelli (in Italian). ^ "Pirelli Company Profile" (PDF). Borsa Italiana. Archived from the original (PDF) on 1 March 2014. Retrieved 21 February 2013. ^ "Leading tyre manufacturers". Tyrepress. 26 September 2013. Retrieved 17 July 2018. ^ "Pirelli - About us". ^ "Pirelli Company Presentation" (PDF). Pirelli. Retrieved 18 May 2018. ^ "F1 extends Pirelli tyre supply deal to 2023". motorsport.com. Retrieved 25 November 2018. ^ "Pirelli supply wsbk tyres". Yahoo sport. Retrieved 21 February 2013. ^ Anzolin, Elisa. "Share price fall deflates Pirelli's market comeback". U.K. Retrieved 26 February 2018. ^ "Pirelli separates from industrial tires unit to become "pure consumer tire company" - European Rubber Journal". European Rubber Journal. 4 April 2017. Retrieved 26 February 2018. ^ Coates, JK; Kincaid, TC; Lanphier, EH (1952). "Evaluation of the Pirelli Underwater Oxygen Breathing Equipment for Use in the Naval Service". Navy Experimental Diving Unit Technical Report. NEDU-RR-2-52. Retrieved 16 March 2009. ^ "Armstrong Finds a Niche in the Tire Market". Connecticut Humanities. Retrieved 22 July 2015. ^ "Cisco taps Pirelli for optical technology". CNET. Retrieved 31 May 2017. ^ Hepher, Tim (30 July 2001). "Pirelli seizes Telecom Italia". The Guardian. ISSN 0261-3077. Retrieved 31 May 2017. ^ "Goldman Sachs buys Pirelli Cables for €1.3bn". www.penews.com. Archived from the original on 5 August 2017. Retrieved 31 May 2017. ^ "Pirelli Opens First Tyre Plant In China". Tyrepress. 12 October 2005. Retrieved 31 May 2017. ^ Editorial, Reuters. "Pirelli to sell broadband ops by end-Oct-source". Reuters UK. Retrieved 31 May 2017. ^ Editorial, Reuters. "DEALTALK-Pirelli seen reviving tyre, real estate split". Reuters UK. Retrieved 31 May 2017. ^ "ChemChina makes €7.1bn bid for Pirelli". The Guardian. Reuters. 23 March 2015. Retrieved 23 March 2015. ^ "PIRELLI Shares - Information for Shareholders". Pirelli. November 2015. Retrieved 6 December 2015. ^ "Pirelli returns to cycling with new road tyres". Cyclist. Retrieved 31 May 2017. ^ "Tyremaker Pirelli to sell 40 percent stake in Milan market comeback". Reuters. 4 September 2017. Retrieved 7 September 2017. ^ "Shareholder Information". corporate.pirelli.com. Retrieved 28 March 2018. ^ "Listed companies - Ownership". CONSOB. 19 June 2018. Retrieved 22 June 2018. ^ "Pirelli Board of Directors". Pirelli. ^ "Annual Report 2013" (PDF). Pirelli & C.
^ "Inter and Pirelli extend historic partnership". inter.it. 14 March 2016. Retrieved 12 May 2018. ^ "World Cup 2014: Brazil furious over Christ the Redeemer statue in Rio de Janeiro in Italian football colours". The Telegraph. Retrieved 19 September 2018. ^ "Pirelli boards Team New Zealand". Retrieved 31 May 2017. ^ "Pirelli and Infront seal five year sponsorship agreement across flagship winter sports events - FIS-SKI". FIS-SKI. Archived from the original on 30 October 2017. Retrieved 31 May 2017. ^ "Pirelli sponsors Alpine World Ski Championship and ice hockey from 2017 to 2021". business.pirelli.com. Retrieved 31 May 2017. ^ "Bridgestone to Cease Tire Supply to the FIA Formula One World Championship". Bridgestone. 2 November 2009. Archived from the original on 4 November 2009. Retrieved 2 November 2009. ^ "World Motor Sport Council: 23 June 2010". fia.com. Fédération Internationale de l'Automobile. 23 June 2010. Archived from the original on 26 June 2010. Retrieved 23 June 2010. ^ Collantine, Keith (23 June 2010). "Pirelli return to F1 after 20-year absence". F1 Fanatic. Keith Collantine. Retrieved 23 June 2010. ^ "Pirelli confirms six different colours for tyres · F1 Fanatic". F1 Fanatic. 18 March 2011. Retrieved 31 May 2017. ^ "How Pirelli's new F1 tyre compounds will look in pre-season testing". Pirelli. 24 January 2019. ^ "Drivers praise Pirelli's comeback season". GPUpdate.net. Archived from the original on 1 December 2017. Retrieved 6 June 2017. ^ Andrew Benson. "BBC Sport - F1 boss Bernie Ecclestone dismisses talk of boycott". BBC Sport. Retrieved 21 April 2015. ^ Lawrence Barretto & Andrew Benson. "BBC Sport - British GP: Lewis Hamilton says Pirelli tyre failures dangerous". BBC Sport. Retrieved 21 April 2015. ^ "Pirelli, explanation on Silverstone' facts and next races". pirelli.com. Retrieved 21 April 2015. ^ "Kevlar belt tyres for Germany, new tyres for Hungary · F1 Fanatic". F1 Fanatic. 2 July 2013. Retrieved 31 May 2017. ^ Andrew Benson. "BBC Sport - Belgian GP: Drivers demand reassurance Pirelli tyres are safe". BBC Sport. Retrieved 21 April 2015. ^ Andrew Benson. "BBC Sport - Fernando Alonso criticises Pirelli tyres after Korean GP qualifying". BBC Sport. Retrieved 21 April 2015. ^ "BBC Sport - Korean GP: perfection from Vettel, less so from the tyres". BBC Sport. Retrieved 21 April 2015. ^ Andrew Benson. "BBC Sport - Indian GP: Pirelli wants limited tyre running on safety grounds". BBC Sport. Retrieved 21 April 2015. ^ Andrew Benson. "BBC Sport - Nico Rosberg suffers tyre failure in Bahrain Pirelli test". BBC Sport. Retrieved 21 April 2015. ^ "Pirelli: 'Prototype tyre which failed on Nico Rosberg's car won't be used again'". Sky Sports. ^ "Pirelli concludes new Formula 1 tyre supply deal". Autosport. 16 January 2014. ^ a b Andrew Benson. "BBC Sport - Lewis Hamilton & Sebastian Vettel call for better wet-weather tyres". BBC Sport. Retrieved 21 April 2015. ^ "Nico Rosberg tyre failure: Hamilton and Alonso raise concerns". BBC Sport. Retrieved 5 February 2016. ^ "Sebastian Vettel says Pirelli tyre failure unacceptable". BBC Sport. Retrieved 5 February 2016. ^ James Galloway. "Sebastian Vettel & Nico Rosberg round on Pirelli after tyre blowouts". Sky Sports. ^ "Belgian Grand Prix: Drivers demand end of blowouts". BBC Sport. Retrieved 5 February 2016. ^ Ian Parkes (3 September 2015). "Pirelli reveals F1 tyre investigation findings from Belgian GP". AUTOSPORT.com. ^ "Pirelli relaxes tyre limits after Lewis Hamilton & Alonso complaints". BBC Sport. Retrieved 5 February 2016. ^ "Italian GP: Drivers told to keep worries over Pirelli tyres private". BBC Sport. Retrieved 5 February 2016. ^ Dieter Rencken & Lawrence Barretto (6 September 2015). "Italian GP: Pirelli reports high number of F1 tyre cuts at Monza". AUTOSPORT.com. ^ "Lewis Hamilton wins in Italy - reaction - BBC Sport". BBC Sport. Retrieved 5 February 2016. ^ "Lewis Hamilton keeps Italian GP win after stewards' investigation". BBC Sport. Retrieved 5 February 2016. ^ "Horner hopes Pirelli's sole tyre F1 deal is extended beyond 2016". Mail Online. Retrieved 31 May 2017. ^ Parkes, Ian. "Formula 1 2017 tyre rules: The key questions and Pirelli's plans". Autosport.com. Retrieved 31 May 2017. ^ "2017 season: F1 looks back for its future with faster, wider cars". BBC Sport. 9 January 2017. Retrieved 31 May 2017. ^ Noble, Roberto Chinchero and Jonathan. "New Formula 1 tyres for 2017 have 'very low degradation'". Autosport.com. Retrieved 31 May 2017. ^ "Indonesia welcomes Pirelli, Italian touch for local shoes". 25 April 2012. ^ "Pirelli launches F1 wheel shaped Bluetooth speaker, P Zero Sound". Retrieved 31 July 2018. ^ "IXOOST official site". Retrieved 31 July 2018. Wikimedia Commons has media related to Pirelli.